I received mine today. It is so lovely. I got these lovelies for my wedding favor and I am keeping 2 for my fiance and myself. I just got to have it. Thank you. These lovely tea strainers came beautifully wrapped. They are perfect for tea baskets and other gifts. The teapot shape is just adorable! I am very pleased!!! used them for a thank you gift for the guests at a bridal party. I used these infusers as prizes for the games that we played. My daughter's shower had a tea party theme so these were perfect. It was the perfect gift for a tea themed bridal shower. A guest had just misplaced her own infuser at home, so was really glad to get this one. These made great favors for a Tea Party Themed Bridal Shower. I added a tag with the Bride and Groom's name with "Steeped in Love" to personalize them. Pamela the Event Designer. . . . . The two times I have ordered from Beaucoup.com, I have received wonderful quality at a reasonable cost. I will definitely consider Beaucoup any time I have party needs. . . . . This was great as a bridal shower favor; we paired it with the porcelain tea caddy; everyone liked it! These little teapots are a great hostess gift for guests at a High Tea held for any occasion. My guests loved them. I love tea, so this was the perfect little favor which reflects my own style and which was a perfect little gift for my guests. The bride-to-be really loved this as a keepsake from her Bridal Tea. It was very unique! I used these infusers to make my Kitchen Tea invitations with. They were perfect for the event and they wont be put aside like ther invitations they will actualy be used. They were also much cheaper in the USA than Australia. My guests loved them. I was given this infuser for a shower gift 15 years ago!! It has been very useful. I have used it for infusing tea, but mostly to infuse warm cider with a spice mix. I put it right into my crock pot with the spices inside. It has never popped open or rusted. The handle did fall off but this was after many years of use. I bought these tea pot infusers for my daughter's bridal shower. I just got them and I love them! The quality is good and they are ready to be given away. They look very cute and elegant in their box with the black ribbon. I bought these for my sister's bridal shower as game prizes. They are very cute and I really like it that it has a small tray for putting the tea kettle on after you are done with the simmering of tea. That really helps to keep your table water-free. I ordered this for a bridal shower. they were beautiful but the package was too small and it looked simple... rich but we didnt get comments about it. I loved this idea to start with, but when i recieved the item it was so small (smaller than palm of hand). I still think it's an awesome idea, but not for a wedding. Maybe for a bridal shower or tea party. Q:Does the lid stay sufficiently closed on this little teapot infuser so that the loose tea does not spill into the tea water in the teapot? A:Yes, the top of this infuser is removable. It is safely secured so no loose leaves fall out. Q:Does this come with packaging in any other colours? A:We only offer this item as shown. We do not have other options for packaging. Q:How does the item open and close when you want to put the loose tea inside? Does it seal to ensure that the leaves don't fall out? A:The top of this item is removable. It is safely secured so no loose leaves fall out. Q:Hey, just wondering if the package we would receive is exactly as seen in the picture? A:This item arrives as shown with the tea infuser, clear box, black bow and "For You" tag included. Q:Would you please let me know how can I personalized this item? Spread the intoxicating aroma of happiness with mini teapot tea infusers. These tea wedding favors are a delightful addition to any tea party. Each whimsical teapot-shaped favor is made of durable stainless-steel with a chain-pull lid and scalloped steel tray. 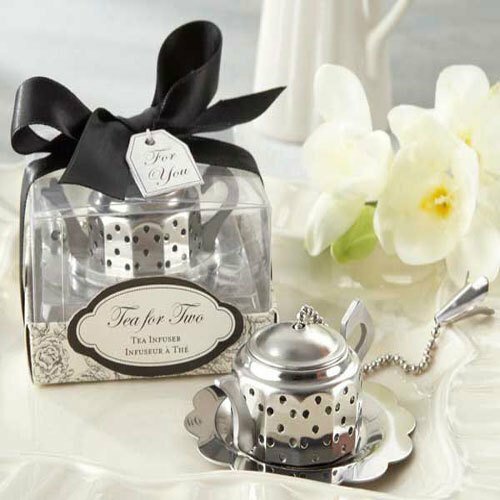 A clear display box, black satin bow and "For You" tag showcase this splendid tea bridal shower favor atop a black-and-white damask base that reads "Tea for Two Tea Infuser." The infuser set measures 1.25"H x 2.25" diameter; gift-boxed, each measures 2.25"L x 1.5"W x 1.5"H.